Back to blogging after a long vacation to India. After all unpacking and cleaning i was feeling a little lazy to get back to blogging :). But few days back a friend of ours send us some URAD DAL laddo and very so yummy that i was tempted to try it myself and now back to blogging . And i found a wonderful recipe in "Cooking at home with Pedatha" . I cannot write enough about this book , just loved every recipe i have tried and these recipes has become a regular in my kitchen. Dry roast the dal until golden and grind to fine powder. Add sugar and cardamom pw. Fry cashews in ghee and add to the mixture. Melt remaining ghee and pour into the mixture slowly enough to bind to laddo. And make small balls and enjoy. Healthy laddooos, feel like having some..
Ladoos look so delicious and fulfilling. Great snack. Laddoos look fabulous- perfectly done! ohhhh...I love these...must try this one.. The laddu looks very cute and delicious! Yum! 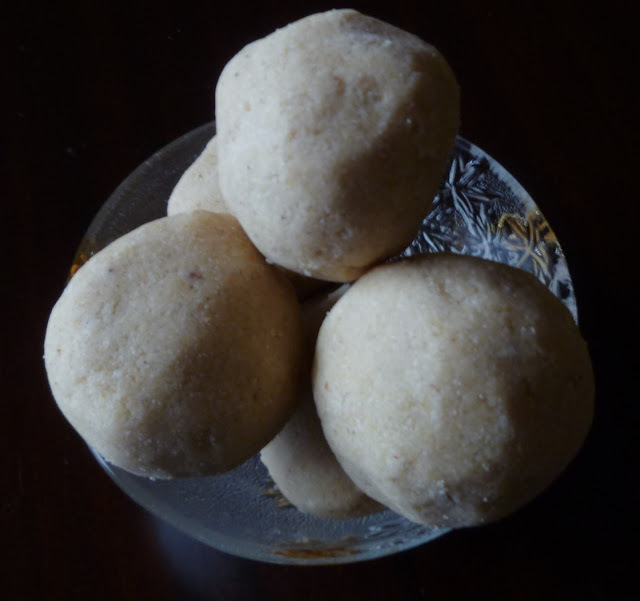 yummy and mouth watering Urad Dal Ladoo. They are nutritious and healthy. Very healthy ladoos. Happy to follow your blog.